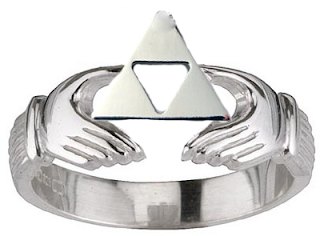 It seemed like such a simple idea to think of, but for all the internet searching that I could do, it didn't seem anyone else had thought to make a Claddagh ring holding a Triforce rather than the heart and crown. A few months ago, I posted some of my geeky finds from browsing Shapeways.com, where pretty much anyone with an idea and some great 3D modeling skills could make their idea come to life. I hoped that maybe someone had made the Triforce Claddagh a reality here, ready for me to purchase for myself, but alas, no. So now, I have this idea and a possible way to make it a reality, but absolutely no 3D modeling skills. I tried my hand at the open-source modeling tool Blender, but had no idea what the hell I was doing and could barely even make a ring-like shape. Shapeways.com does have a forum where you can post your idea and find a modeler, but I feel too awkward doing that for some reason, so I sent a message to a friend in design that I knew. Or maybe I tweeted about needing a modeler and he contacted me? I can't remember. Either way, he asked me to send him a mockup of the basic idea and he'd pass it along to his friend and get us in touch. So I whipped out my terrible Photoshopping skills and voila! from milkool's etsy - I have one! It's amazing. Benjamin, the designer/modeler, got in touch with me and agreed to help me out and make a model. He had previous experience designing for Shapeways, and knew their file and model nuances, so it was probably easier for him than any random designer I could have found on Twitter. We corresponded over a few months, tweaked the design here and there, and within a month he had two versions (one with sleeves and one without) available to be printed in a cheap plastic. From there we could determine the fit, and see how the finger details would turn out. I ordered both, sleeveless and sleeved (pictured) plastic versions. The fit was absolutely perfect, as were the details. I let Ben know and he said he would have to tweak the design slightly for metal printing, since metal usually prints smaller. So I wore my plastic ones around for a bit while he tweaked and got started at a new job. 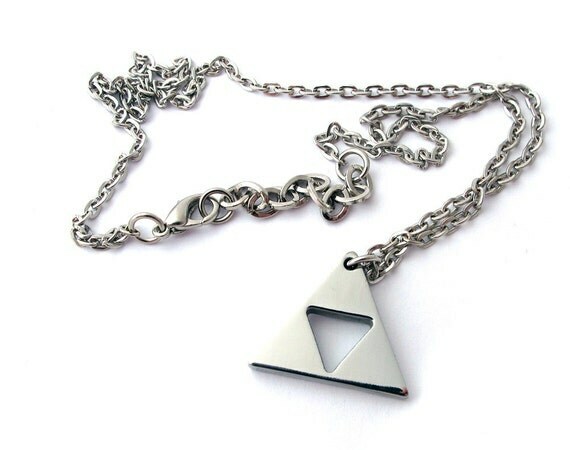 A few months passed and then, an email with links to order metal ones! I ordered the sleeveless version, since I found wearing the plastic ones more comfortable - at least slightly. I had a bit of trouble deciding on a metal, but since the stainless steel (~$20) isn't polished and has more of a worn look to it, I decided to shell out the extra money and order it in polished sterling silver (~$50). And then the hardest wait began. I got my email saying my order was processed. Then a few days later one telling me my order was being sent to the printers. Then, finally, after about two weeks, a shipping confirmation. And finally, today, I saw the Shapeways box just waiting for me. It is perfect. In every single way. Thanks SO much again to Benjamin Peters for his help, time, amazing work and for making this idea a reality. EDIT: Ben has seen the popularity of this post and mentioned he will be working to make this ring available and in more sizes over the coming weeks. I'll update with a link to purchase as soon as I have one. 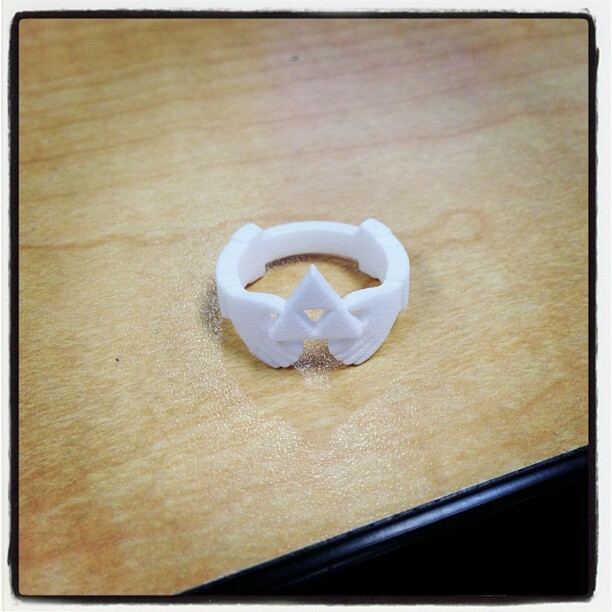 The Triforce Claddagh ring is now available to the public, in various sizes, materials and colors! 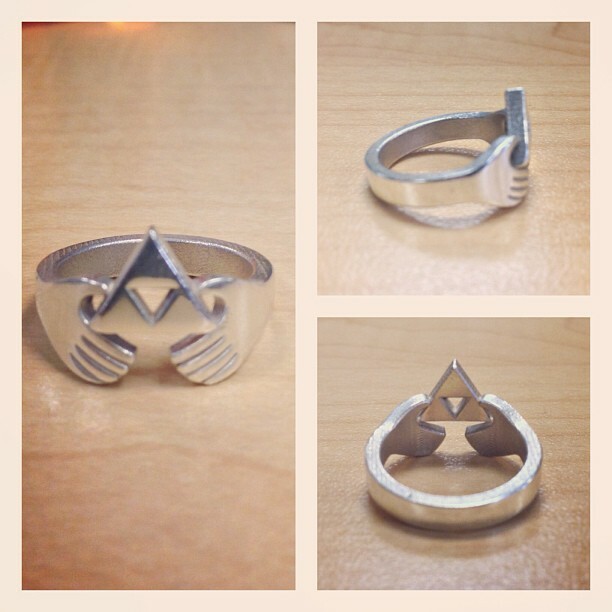 You can purchase your own ring here! Great ring. 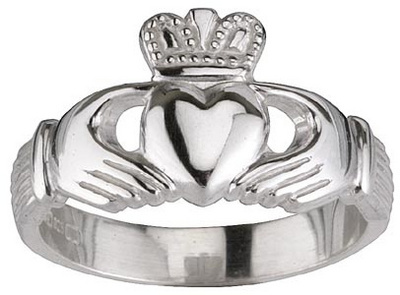 I wear my traditional Claddagh ring every day and I'd definitely wear this one. This is really, really cool. 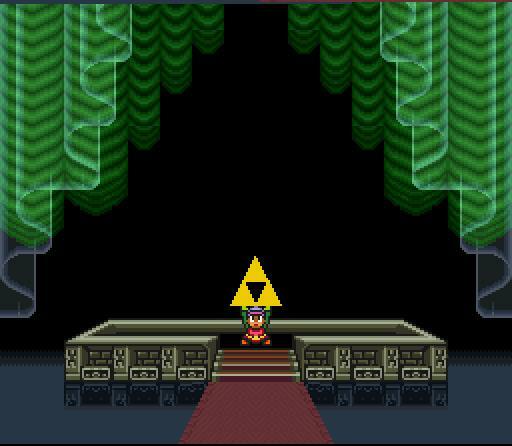 The Claddagh story of friendship, love, and dedication has so many parallels in the Legend of Zelda. It really is a collision of my two greatest obsessions. I am simply in awe. Thank you for sharing this wonderful work of art, it is beyond amazing. Disculpe esta a la venta alguna copia de el anillo o de la cadena...? I WANT ONE SO BAD! But it's totally awesome that you're the only one who has one right now! I'm totally jealous! Must have!! Hope they're available soon!! !